Well, I can't win Phantasie II. Something is askew with my game and I can't figure it out. (My best guess is that I started playing an existing game by accident instead of re-initializing the first disk.) As much as I like the game, I've decided it's not worth fretting about. I got most of the way to the end and enjoyed myself along the way. These last few days have delivered an object lesson about obsessively playing every CRPG to its conclusion, and it wouldn't be worth the time to re-scout every inch of the game for what I missed, or to start over with new characters. The problem is the mising Beast #1, the "giant constrictor," theoretically the easiest of Pluto's eight minions. He's supposed to be wandering the overworld somewhere, but I've gone over every square in the overworld, the underworld, and the dungeons, and he's just nowhere to be found. I've otherwise cleaned out every dungeon, slain every other beast, collected every other amulet, and acquired the Orb, so that's "nearly won," at least. I have everything I need to win except Amulet 1. Pluto's Smallest Castle was, despite its name, a fairly large castle with eight separate entrances. Seven of them led to an unwinnable battle with Pluto (oh, I'm sure he's killable with enough levels and luck, but I didn't have the patience to try). But a scroll alerted me to use the western entrance and look for a secret door, leading to the rest of the cavern network. There, amidst multiple battles with demons and devils, I defeated Pluto's Giant Wyvern. One odd encounter had my party following a troll throughout the dungeon until he finally gave us a scroll. We then had to beat our way back through half a dozen monster parties. But the scroll outlined a path through the lava to Pluto's Menagerie, so it was worth it. Making my way across lava. Pluto's Menagerie was also swarming with demons, devils, giants, dragon kings, and high-level spellcasters. Even though I stocked up on magic potions before visiting, I had to retreat a couple of times, which was annoying because it involved hiking across two screens of lava to the nearest town. A long, winding corridor packed with encounters led to a teleporter with six numbers, each leading to a different section of the Menagerie. One of them led to Beast #8, the most difficult of the lot, the Demon-Dragon. It took me about 10 tries to kill him without losing most of my party, and even then the best I could do was two members killed. (Fortunately, I have the "Resurrection" spell.) He had more than 350 hit points, got about 10 attacks per round, and did more than 50 points of damage with each hit or breath. This demon-dragon isn't taking any of my $#@*. That was as far as I could go. I found the way to the Ice Dragon, but without all eight of the beast amulets, the game said I was too scared to approach. In general, the late game featured a lot of battles with individual, high-level enemies like cloud giants, dragon kings, high demons, and high devils. They might have one or two allies, but there are very few large parties. "Fireflash 4" becomes the most important spell; a player would be extremely hard-pressed to win without it. By the late game, both of my clerics, my mage, and my thief were capable of casting it. I let it do a lot of the work, gulping potions when my spell points got low. Judging by what walkthroughs tell me and what I can extract from the text on the disk, if I had been able to acquire all 8 amulets, I would have been able to approach the Ice Dragon in Pluto's Menagerie. Although the game gives an option to attack, the game apparently has the party think twice after hearing a threat from the dragon. If you choose to talk to the dragon, you have the option to try to feed him gold or "the weakest party member," but he's not interested in either. If you feed him the Orb, he crunches it down. Somehow, destroying the Orb destroys the evil possessing the dragon, and he gratefully flies away. Filmon teleports the party out of the dungeon to his hut and confirms that destroying the Orb broke the curse on Ferronrah. He then tells of Nikademus's forces marching on a continent to the north, presumably Scandor of Phantasie III, and invites the party to continue their adventures in the sequel. 5 points for the game world. The backstory and lore aren't as expansive as other titles, but it's well-plotted, tightly-written, and generally free of plot holes or logical inconsistencies. The in-game scrolls, the manual's backstory, and the physical features you find in the landscape all work well together. 3 points for character creation and development. It's fantasy boilerplate. I generally forgot about the skills--they play a passive role in the game. The first and third titles had some needs for particular races and classes, which this one didn't, and I generally forgot I was role-playing gnomes, monsters, and halflings. Leveling slows down markedly in the second half of the game. My character aged 9 years during the course of the game. 4 points for NPC interaction. Named NPCs play a key role in the game and impart information about the lore of the land and the quest steps. There are no dialogue options, but there are some encounter options with these NPCs. 5 points for encounters and foes. In their strengths and weaknesses, special attacks and defenses, the enemies of Phantasie II are only average compared to other games of the era. The titles do a better job with the miscellaneous role-playing options, encounters, and small puzzles that you get while exploring the dungeons. They don't quite rise to the level of good role-playing--most options are either "good" or "stupidly evil"--but they're a start. 4 points for magic and combat, basically a Wizardry-derived base with animation, but the animation adds a layer of tension and fun. As with Wizardry, the developers did a good job tightly controlling magic use through limited spell points. A little too much rests on just a couple of spells, though, and physical attacks become undervalued in the late game. Battling one of the bosses. 4 points for equipment. You only have weapons, armor, shields, and potions--no accessories--but the distribution mechanic is fun, and I like the way that the items are randomized in the world, not found at fixed locations. The series suffers from a lack of special or "artifact" items. 2 points for the economy. Save for potions (which are cheap), the store is mostly wasted--you start with a decent set of equipment and find the rest. You're either saving every gold piece for training (early game) or running into the maximum value for the gold variable (late game). 4 points for an interesting main quest with some randomization (which sank me, unfortunately), multiple steps, and even some small "side quests" (killing Pluto, rescuing Filmon's friends). 3 points for graphics, sound, and interface. The first two are era-tolerable but nothing special. I didn't care for having to scroll around menus when there was a perfectly-good complete keyboard in front of me. I'm rating this category for the C64 version, so mentally increase it a couple of points if these elements are notably better on your preferred platform. 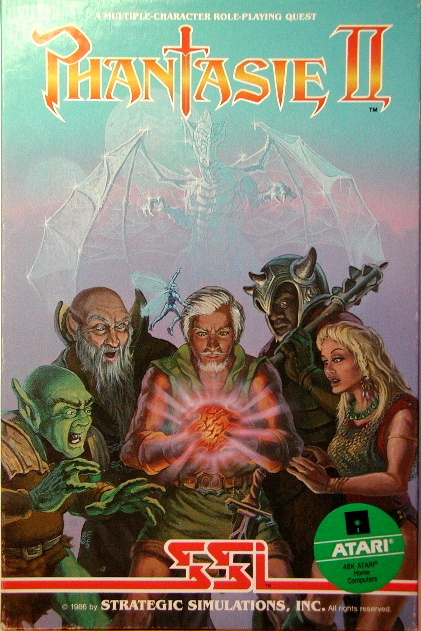 The Atari ST version was more colorful and elaborate. I wish I didn't hate the emulator so much. 5 points for gameplay. Although there's a natural order to the dungeons, it's mostly non-linear, and you're encouraged to visit some of the dungeons multiple times. I wouldn't call it "replayable," but the pacing and difficulty are right on the money. Wow. Without even looking at my reviews for Phantasie and Phantasie III, I managed to land on the exact same score of 39 that I gave to the other two. This raises the question of why Phantasie III didn't earn a higher rating given that it added several new elements. (I did rate it higher for combat, where most of the elements are found). Looking over my review, I think I failed to realize that the three titles were intended as a trilogy, building on the same story. Instead, I thought that the developers kept using Nikademus as the villain because they lacked imagination. I also apparently thought that the third game dragged a bit. Still, I won't worry about a few points. 39 is a pretty high score for any era (so far). I'm debating whether to subtract points for whatever bug failed to bring me the encounter with Beast #1 so I could win the game. Normally, I would, but I can't find anyone else talking about the same problem, so I'm going to have to assume that I just messed something up. This is where the Phantasie games excel. The dungeons aren't a random configuration of rooms and corridors: the developers gave some thought as to the layout of castles and dungeons. A palace is going to need bedrooms, kitchens, servants' quarters, and a dungeon, for instance, and they designed it accordingly, giving each room a name and maybe even a paragraph of text as you entered. When you meet monsters, it's not some random hodgepodge of bats, priests, zombies, and goblins all traveling together. You fight kobolds and orcs in the kobold village, insects and vermin in caves, and demons and devils in the Netherworld. In other words, the series pays attention to setting the same way that a good tabletop RPG module might. It makes sense, of course, that developer Winston Douglas Wood was a veteran of Dungeons and Dragons and RuneQuest campaigns. According to a 2013 interview at RPG Codex, he was a sophomore in college when he began working on Phantasie, and he was in graduate school by the time it was published. This was an era in which SSI, lacking a lot of RPG experience of its own, readily published titles submitted by independent developers such as Tom Reamy (Galactic Adventures) and Chuck Dougherty (Questron). Ultimately, none of these independently-developed titles (including Phantasie) had the staying power of SSI's internally-developed games (Wizard's Crown, Pool of Radiance), which built upon the company's wargaming expertise. As the various ports above indicate, Phantasie became very popular in Japan, leading to the Japanese-exclusive Phantasie IV, which I unfairly brushed off at the end of my Phantasie III review. I assumed it had been developed by an unscrupulous Japanese company taking advantage of the name. In fact, Wood says in the interview that he designed Phantasie IV himself, although Japanese programmers at Starcraft wrote the code for the PC-88, PC-98, and MSX. There were vague plans to port it to western PCs, but its release corresponded with the decline of the classic Phantasie platforms like the C64 and the Apple II, and by that time Wood was deep into his "real" profession working for his father's pipe network analysis software company, of which he is now a co-owner. Phantasie IV clearly shows the series lineage, but it has little squiggles instead of actual text for game options. Wood developed one other title for SSI--Star Command (1988)--and designed Starfire (1994) for StarCraft (another Japan-only title). At the time of the RPG Codex interview, he was working on and off on Phantasie V, but that was almost 4 years ago, and there doesn't seem to have been any news since then. In the interview, Wood suggests an uncertainty about the game's legacy. While it's true that third-person games largely won the interface struggle (at least until the late 1990s), you can see a clear homage to Phantasie in some of the diskmag titles we looked at in the late 1980s and early 1990s. In both combat and exploration, John Carmack's Dark Designs triology (my reviews start here) could easily be mistaken as having been written by Wood. I suspect that the author of the two Legends of Murder titles was also a player. And of course we saw an adaptation of the character ranks and character leaping in Legend of Faerghail. As I said when I started this series, I'm glad I had a chance to return to the Phantasie universe and look at it properly, not just in the rushed way that I covered I and III and everything else during the first two years of blogging. They are stand-outs among 1980s titles and still fun in any decade. Update: based on some commenters' messages, I decided to run around on one of the wilderness maps and give myself one more try to find the first beast, the giant constrictor. I found him almost immediately. He was so easy I forgot to take a screenshot of the fight. When he was dead, I had the last amulet. One by one, I had my characters examine them and gain their associated "beast runes." With the eight beast runes, I returned to Pluto's Menagerie. I had to slog across dangerous lava, healing myself as I went, and fight about a billion combats against fixed monsters in the dungeon's hallways. Combat with a cloud giant and minions. Eventually, after exhausting most of my spell points and potions, I found my way to the dragon's cave again. This time, the game didn't tell me I was too scared to face the dragon. I walked up to it and fed him the Orb. As noted above, the dragon flew away after destroying the Orb, saying that the curse was lifted. Filmon teleported me to his hut and confirmed the same, then led me outside for a victory party in which each of my characters was introduced and the crowd cheered. I assume it said "from Gelnor" if you used an imported party? The final screen has Filmon setting up the third game. No change to the GIMLET, but a reasonably satisfying ending. I'm glad I don't need to carry it as a loss. Martian Dreams may or may not be the next new game. I need a stretch of time at home when I don't need to close my computer or kill the emulator to make sure the saving/crashing problem doesn't recur. The next time I have 3 or 4 days off the road, I'll play it. Realms of Darkness was coming up on the list, but upon examination, it appears to have been released in early 1987 rather than 1986. You actually need to use each of the amulets which adds beast runes to your character sheet. Huh. I missed that. But either way, I never got the first amulet, so no first rune. I am surprised that you don't like the Atari ST emulator. Have you tried Steem SSE? It has a nice easy to use GUI, much better than any Amiga emulator I've seen. Once I have the game running, it's not so bad, but the interface for loading the game disk is very confusing. >>Martian Dreams may or may not be the next new game. I need a stretch of time at home when I don't need to close my computer or kill the emulator to make sure the saving/crashing problem doesn't recur. You can get Martian Dreams for free from Gog (https://www.gog.com/game/ultima_worlds_of_adventure_2_martian_dreams) configured to work on modern PCs. The GOG version of DOS games is "configured to work on modern PCs" by simply packaging them with the same emulator I use for all DOS games. In any event, I have the GOG version of MD. It has the same corruption/crash that the non-GOG version does, which means that I can't trust the save game feature. Since DOSBox almost always crashes if I close my laptop and re-open it, I need an uninterrupted series of days (or at least hours) where I can play the game without saving. I have been playing Martian Dreams through Dosbox on the Mac without incident. I hope you get to play it-- it's a flawed but fun game and I'm looking forward to your final review. Doesn't DOSBox support save states these days? This should solve any problems with ingame saves not working, I reckon. Ah, that's a pity. I was hoping the Gog version mgiht work for you. I wonder if it's a problem with the game running under emulation generally or if there's soemthign specific in your setup that's causing it. I have the GoG version but haven't played it yet so unfortunately can't tell whetehr it's working for me. There is a fork of DosBox that supports save states. I've had mixed results with it, but if you test it thoroughly with a specific game before relying on it, it might work for you. Downloads on the left, the emulator is fully in English. You really don't need to go to this kind of trouble. It would be much easier to save normally, but to keep backups. I've reproduced the freezing bug, both with and without DOSBox, but I've also beaten the game normally. The bug seems to be that if you save too often in problematic areas, such as forests, or the 180 meridian, the game state becomes unstable. But the only way I've reproduced this bug is by deliberately trying to. Rather than trying to beat the game in one session, I am sure it would be easier and less frustrating to just back up your saves (might as well back up the whole game folder) periodically. Then if you find the game locks up, just roll back to an earlier file. There's some discussion here, and the good news is that this bug seems to mainly occur early on in the game. I tried the DOSBox version with save states and found them unreliable. They SOMETIMES work during the same session as they were created. They almost never work after re-starting the emulator after shutting it down. I didn't mean to suggest that I would play the entire game without saving. But I know that saving during the early parts of the game seems to cause the corruption, so I need at least 4-5 dedicated hours that I know I won't be closing my computer. Even that may be more cautious than necessary, and could backfire if you save for the first time several hours in and that one turns out to be corrupt, and now you have no backups of earlier saves to roll back to. The GOG thread suggests that saving far enough south-east will prevent future corrupt saves. I can't verify this, but one thing mentioned that I can verify, is that when your game is corrupt, the game will freeze on the third save. So what you can do is, whenever you save your game, make a backup, and then save three more times. If it doesn't freeze, then rejoice, for the save you just backed up isn't corrupt! Restore the backup, load it, and resume play. Ah, somehow I was under the wrong impression that savestates had long since made it into offical DOSBox. I stand corrected, thanks for the heads up. The SMT games are all fantastic, I've quite recently played IV and am now playing the sequel. Without any more specific in-game references (although things might have been lost in translation), I'm hesitant to consider Pluto a hommage to Phantasie (or any other game), though. Pluto is, after all, the roman name of Hades (greek god of the underworld), and thus not at all out of place in a game populated with an almost exhaustive list of mythological beings from just about every culture on earth, including many other major deities. I've never been shy about my love for the Phantasie series. With few exceptions (like the original Pool of Radiance), I found the three games (which I beat repeatedly on the C-64) best translated what I liked best about pen and paper RPGs. In any case, it is indeed a shame that the series never continued beyond IV (I even have a boxed copy, but no Japanese language abilities), although I do have Star Command waiting in the wings. In any case, in terms of "influence," the only direct influence (aka, rip-off) I'm aware of is Asgard Software's Legends and Legends II: The Sequel, for the TI-99/4a. These were 1987 and 1989 releases, respectively, which was obviously well after that platform was officially discontinued. In any case, they're virtual (and absolutely unofficial) clones of Phantasie I and II, with obvious concessions to some of the limitations of the TI-99/4a, like a four member, instead of a six member, adventuring party. Wow, these guy should have won some prize for the most imaginative naming in RPG ever (or anywhere else for that matter). Thanks for the positive Phantasie review. I know you don't rate these games based upon the opinions of your fans, but Phantasie was one of my first ever CRPGs along with Ultima IV and Temple of Apshai, so it will always have a special place for me. I'm just so happy that it is getting recognition after all these years. I sent you some info on NN some time ago; let me know if you want me to dig it up again. In short, none of the current versions really do the original justice. You can play (but not save) in the original client, but I believe you can only have one party member which makes some of the battles... difficult. The FRUA version is supposedly a complete port and you can create a party and save, but I found it oddly empty and most of the early sections laughably easy because you had a party when the game expected you to be still wandering around by yourself. I'm not sure which is better for your look, but good luck! I've already written the posting. I look forward to your comments when it comes out. Very solid posting schedule lately. I look forward to each one, particularly to the end of Fate. Interesting that you won't play any JRPGs for consoles, as Phantasie seems pretty similar to early JRPGs like Final Fantasy 1. One has to admit that allowing JRPGs would probably quadruple the size of the gamelist, so it's probably well they are excluded. Quadruple is a bit of a stretch as there aren't that many translated, but yeah, the list is way too huge for one man's lifetime as it is. FF1 was released for the MSX in Japan, so it's a CRPG. Only in English for the NES though, I believe. Phew! ;) It would be interesting to get the perspective of this blog on that game. And yeah, the combat system here sure looks very JCRPGesque. Interesting to hear about Japan-only P4! Good point! I forgot it was on the MSX. Honestly, I'm just really curious about how he'd respond to FF1. I actually feel like he'd enjoy it, though certainly not most other JRPGs. FF1 and 2 are the only non-MMO games in the numbered series (as of now) that aren't on the playlist in some form, because every other game has or almost certainly will (they haven't announced one for XII, but it is all but certain at this point) get a PC port. I'm pretty sure the opposite is true. Chet MAY play FF1 as it had a MSX releases which qualify it as a cRPG. Whether he will play those or not, I am not sure, as the English localization we all think about is a console one and there may not be a full English version of the computer version. I hope he picks it up at least for a one-off post because I'd love to see him look at a big part of my childhood also. After that, only Final Fantasies 7 and 8 had cRPG releases per his definitions. While most of the rest had PC releases down the line, they were emulated ports or similar which does not qualify them for the playlist. After that... MAYBE 13 counts but Chet wouldn't get there until 2014 and by that point who knows what the rules will be. The Addict's rules are pretty simple - a game must be properly ported to PC without the use of emulation. No emulation of any kind is used in the Final Fantasy PC releases, therefore they will go on the list. The MSX release of FF1 does not use the roman alphabet, so it will not go on the list under the current definition. I recently played Phantasie II a little bit, and I found Amulet 1 in outdoor area one screen west of Haslemere, right on the beginning of the game (my characters were around level 3 or 4 by then). I was playing Atari ST version on Hataroid emulator (on Android tablet). For Atari emulation, I like Hatari lot more than Steem for some reason. That is where I beat him a couple of days ago in the C64 version. The overland map with Senog's Laboratory. It took some time wandering around though. I am guessing there is a low percentage chance to get the encounter on the map. I happened to get it on a grasslands tile (in case terrain matters, but I doubt it). The monster data table in the game happens to group beast 1 with the other level 4 monsters so it makes sense. Perhaps if the addict did not spend much time in the wilderness on that map then it is still there. However, you can only kill it once so a disk image online could easily already have the first beast dead and need to be reset. #$*&@# hell. Just to be sure, I loaded the game up again and told myself I'd wander around that map for no more than 5 minutes. You understand, I've previously wandered around it about 20 times before. I met the damned monster on my first encounter. Now trying to decide whether to bother to finish after having written all the above. You could probably just edit this post to include the ending, if you want. That's what I did! See above. I know this article is a year old, but I just want to extend a huge THANK YOU for the advice about probably the single most irritating aspect of Phantasie II.... finding Beast 1 - Pluto's Giant Constrictor. Based on what you said in the article about some suggestions from commentors, I followed the same suggestions. I already have all the other beast runes but without Amulet 1, you are dead in the water. Note: Using a hex editor to add amulet 1 to your inventory will NOT work. Oh you'll get the amulet, and you can examine it, but none of your characters will actually 'get' the beast rune. Yes, I tried. Based on your commentors suggestions, I went and combed all the land area in the overworld on the screen west of the town of Haslemere. Once I covered every single square I moved down one area to the section where you find the town of Saxlingham and Senog's Laboratory. About halfway down I finally encountered Pluto's Giant Constrictor. I agree with what other posters posted. The Giant Constrictor is a Level 4 monster. Casting the Monster Evaluation spell confirmed the wilderness area on the tile west of Haslemere and the wilderness area near Saxlingham show Level 4 monsters are nearby. Beast 1 - Pluto's Giant Constrictor - In the overworld in the wilderness area where the town of Saxlingham and the dungeon Senog's Laboratory can be found. Beast 2 - Pluto's Winged Devil - In the overworld in the dungeon Filmon's Straw Hut. Beast 4 - Pluto's Demon Fly - On the small islands near "The Smuggler Inn"
Beast 7 - Pluto's Giant Wyvern - In Pluto's Menagerie, easily reached by using the secret door by entering the dungeon from the middle-western entrance. Beast 9 - Pluto's Ice Dragon - In the lower right of Pluto's Menagerie - Only reachable after obtaining the other eight beast runes and using a secret code to open the door, obtained from the Forgotten Temple. It's a weird phenomenon. Another commenter mentioned the same thing somewhere. It's like Beast #1 doesn't show up until you complain about it, and then suddenly you find him immediately.